The ultimate storage solution for all your utility needs, this excellent cabinet is made from premium polypropylene resin and features adjustable shelves for versatility and convenience. Unique doors can be padlocked shut for added security, while the compact design fits neatly in a variety of environments where space may be limited. Dimensions 26.77 In. X 14.96 In. X 67.32 In. This utility cabinet fits perfect in the space we have in the hall. We have limited space and this allows us to store some of our larger household items. I am so glad that I searched on overstock.com. This storage cabinet has been wonderful. I use it in my space room to hold extra small appliances and supplies. The shelving is easy to adjust and can hold quite a bit of weight. Its also small enough that it does not take up my entire room space. I needed a good quality utility storage cabinet for my laundry room, one that was large enough to hold a lot of laundry items, but also had the smaller shelve depth dimensions to easily fit into my laundry room. This particular one fitted the bill! 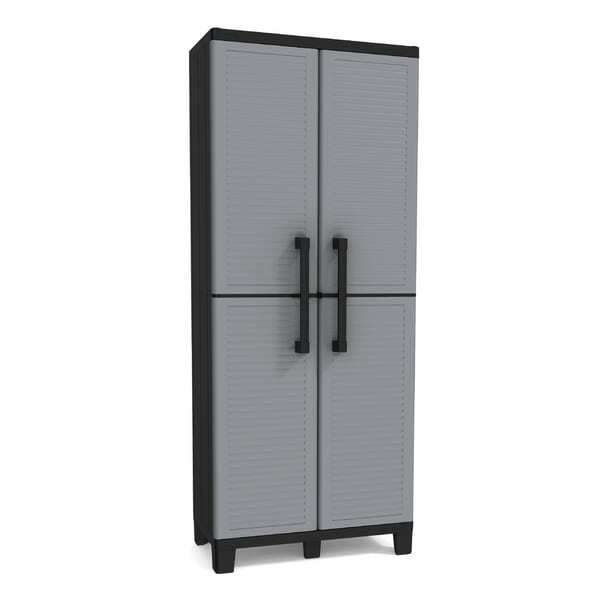 The most impressive thing about this storage cabinet is, that it is a very quality built one that's strong enough to hold many items, with adjustable shelves for storing both smaller and oversize products. Lightweight and easy to put together. I bought this for my garage to hold extra can goods, kitchen appliances etc. It has tons of space barely takes up any room and I've now been able to declutter my kitchen! I love it! These cabinets are everything! I bought 5 and lined a wall in my garage with them. Super easy to put together, you can put one together in about 10/15 minutes. The shelves are sturdy and hold tools and whatever just fine, however the top isn't made to hold stuff, I had something sitting on one for a few days and it bent the plastic a little. 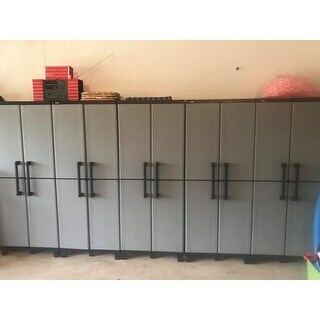 But otherwise they are great and totally spacious, I searched online for garage cabinets a while before I bought these and am VERY happy with my decision!!! I bought two of these, not off this site, but they are the exact same. In one I have gallons of paint and other paints, stains, rollers etc. and its held up for the last 8 months. In the other, I keep miscellaneous stuff, like, grass seed, tackle box, and other random things. It looks nice in the garage with my black floor mats too. After I got the first one put together (took me about 45 mins) it was easy putting the second one together, as that one only took me 10 mins max. I had fun putting this utility storage together. They look nice, and are easy to put together. The adjustable shelves are really great! Not too sturdy, but it has the extra storage space we needed on the patio. Looks pretty good when set up but feels flimsy. I should have expected that for the low price, but just a heads up. It’s doing the job as long as I don’t put very heavy items in. I bought two of these to use for my covered patio to store my junk and kids toys. Will buy more for my garage. Reasonable price. Thank you. Purchased for my grandson. Wanted something sturdy, practical, and industrial looking. He is in junior high, he assembled it , said it took a while to figure out but happy with results. I liked the cabinet doors so he can cover his things. Large but light weight enough to move around. The shelves are also adjustable and you can store just about anything inside. Yes I’d recommend! When I took it out of the box, I was shocked at all the parts, and thought there’s no way I can do this. I’m just not good at putting things together. And it came out perfect couple hours in the garage, and it looks great. Nice storage product and easy and quick to put together. The top needs to be stronger as you can not set anything on the top or the doors do not want to close properly. Easy to put together. Perfect for out in my storage shed for all the horse supplements. Perfect, easy to assemble and very sturdy! Was pretty simple to assemble we use for storage on the Lanai plent of space and keeps everything organized. Have purchased two of these nad they sit on either side if the Lanai refrigerator. "How much weight can the shelves hold?" "Can this be secured to the wall so it won't be a tipping hazard?" Yes this comes with hardware to secure it to the wall. "Does this need to be put together? Or is it already assembled?" "Can the cabinet be placed on a covered deck? I see it's made of resin." You sure can. If you plan ever having it sit where it can get wet, I would take some clear caulking and cover any seams . It's a really nice storage cabinet but it is not air tight! We have 4 of these in our pole barn garage and they really help to keep the place looking neat and clean. Good Luck!! "Adjustable shelves? Does that mean some or all of them can be removed? I'm looking for a broom closet/cabinet." This is actually 2 pieces put together - top and bottom, so the middle shelf is not adjustable. It's actually not a shelf, but where the 2 pieces are connected. This would not work for a broom closet. "What are the measurement on this?"